The authors wish to dedicate this paper to Friedel Klussmann, the cable car lady, whose efforts of a half century ago gave to San Francisco a gift of inestimable proportions--its cable cars. Herb Caen, San Francisco's foremost newspaper columnist, rumored it. Roger Lapham, San Francisco's "infrequently beloved" businessman mayor, confirmed it. Friedel Klussmann, the President of the San Francisco Federation of the Arts, stopped it. The issue was a simple one; should San Francisco keep the city-owned Powell Street cable cars running? On March 4, 1947, within the sight of Roger Lapham’s office, the San Francisco Federation of the Arts and the California Spring Blossom and Wildflower Association held a joint meeting attended by leaders of 27 women's civic groups. Rallied by the impassioned pleas of Friedel Klussmann, they formed the "Citizen's Committee to Save the Cable Cars." Lucius Beebe and Charles Clegg were later to write, "It was destined to wield the terror and authority once possessed by San Francisco's Vigilantes of 1851." By November, Mayor Lapham and his allies on the San Francisco Public Utilities Commission wished they had never heard of Powell Street and its cable cars. By 1947, only the city-owned two Powell Street lines and the conservatively managed, privately owned California Street Cable Railroad and its three lines remained. The Cal Cable was not directly in jeopardy in 1947; it was still marginally profitable. As the post-earthquake cable car system shrunk only a few San Franciscans complained, since to the majority, "progress" had been served. Nevertheless, 1947 was to be different. Successful economic arguments were to be used by the proponents of the Powell Street cable lines. Many San Franciscans and non-San Franciscans, now were alarmed. For the vast majority "progress" was not to be in the form of buses struggling up the Powell Street hills. January 29, two day's after Mayor Lapham’s report to the Supervisors, the Chronicle headlined, "Cable Cars On Way Out; City Orders Super Buses," "Days of the Gripman Are Nearly Over." Lapham’s and the Public Utilities Commission's plans for Powell Street were bizarre. Ten dual-engine Fageol Twin Coaches were on order to replace the 27 (22 scheduled cars daily) Powell Street cable cars. Upon arrival of the "superbuses" in late February, they were to be assigned for Sunday traffic along the cable lines, eliminating "the present overtime expenses on Sundays." "Gradually," the Mayor informed the citizenry, "as cable cars break down, coaches will replace them for daily use." Twin Coach promoted itself by buying the front cover of the April issue of Bus Transportation magazine. Here Twin Coach boldly stated "Motor coaches with a FUTURE...replace cable cars with a past." Thanks to Friedel Klussmann, the April issue of Bus Transportation is affectionately referred to as the "April Fool" issue. No sooner than the news of Mayor Lapham’s message advocating junking the cable cars reached the public, an unidentified protestor screamed over the telephone at the Mayor, "Don’t you dare touch those cars!" "I’m an old San Franciscan and I won’t stand for it." On January 30, the politically astute Herb Caen wrote, "About those cable cars: The Powell St. line is a plucked duck, that’s for sure. But keep tabs and see if the situation doesn’t boil down to this eventually: The Calif. St. line will be kept in operation, for tourists and sentimentalists, at greatly increased fare--maybe as high as 20 cents a ride." (cable car fare, in 1947, was 7-cents; fifty years later it is $2.00). As the protests mounted, this was to be His Honor’s strategy to blunt the howls of indignation. More important than Herb Caen’s speculation was the surprising announcement from James H. Turner, the Utilities Manager, on the very same day, that "no time should be mentioned for the possible replacement of the cable cars." Turner declared, "the 10 twin-engine buses had not been selected as replacements for the Powell Street cable cars," but "were chosen for (existing) tough hill routes." He continued, "the fact someone in his office said the new buses would be used on Powell Street was just sort of a rumor." In response to Mayor Lapham’s statement that the cable cars were "antiquated and unsafe," Turner declared, "The Mayor’s statement was merely a directive for discussion and something for us to consider." Adding to the confusion was the announcement from Public Works Director Harry Vensano that the "superbuses" could not safely climb the Powell Street hills in wet weather. The Mayor had proclaimed, "that on hills wet and dry, the twin-engine affairs showed their ability to climb and maneuver." To make Powell Street safe for the "superbuses" in wet weather would require removing the red bricks from Sutter to California street and replacing them with a three-inch coat of cement. Vensano estimated this would cost $24,000. No money was in the budget for the work! Before placing the Twin Coach order, the Municipal Railway tried a "superbus" out on one of the city’s toughest hills, Castro Street. The coach, which was loaded with men and streetcar brake shoes to approximate a full load, successfully climbed the maximum 18.4% grade (the steepest grade on the Powell lines was 17.5%). The problem was that the City had not paved Castro Street with red bricks! Six days after the Mayor’s fiat, on February 3, the Chronicle editorialized, "bus lines would be a good deal less expensive. But against this saving should be weighted, first, passenger comfort which has some money value even if it cannot be demonstrated, and, second, the market value of an institution which helps make the city stand out among cities of the world." San Franciscans awoke Thursday morning, February 20, to the Chronicle headline, "S.F. May Vote on Cable Cars." The lead paragraph informed the residents that they, "may get a chance to vote whether to junk the cable cars in favor of bus lines or keep them rolling for sentiment and tourists at a money loss." With respect to the Powell Street cables the headline was misleading. Voters were in fact not voting on whether or not to retain the Powell Street lines but instead the issue was the purchase of the Cal Cable. A technical committee of city officials drafting a report on what’s wrong with traffic and transit, and what to do about it, had recommended a bond issue of "possibly $400,000" (soon trimmed to $250,000) to purchase the California Street Cable Railway. If the voters approved, the California line would be the only cable service retained by the City, since it was the cheapest to operate. The City would abandon the two Powell Street lines and two of the three routes operated by the Cal Cable. Herb Caen proved to be a prophet. The Mayor had a retreat position (this became His Honor’s official position on March 10). But, the cable car saviors had little to cheer. The Mayor had been elected as part of a civic revolt designed to bring good efficient government to San Francisco. What could be more efficient than the elimination of costly obsolete cable cars? After all, the Powell Cables were showing a weekday loss of $1.77 per hour per car and a Sunday loss of $2.90 an hour. The "superbuses" would generate an hourly operating profit of $1.20 weekdays, 17 cents on Sundays. To add to this economic logic the Mayor argued, "the rails, which are no longer being made, are worn dangerously thin. Cables (hemp rope stranded with steel) are difficult to obtain. Gripmen are getting old too, and younger men are not interested in pulling grips. The system is unsafe." However, Mrs. Klussmann and the "Citizens’ Committee To Save The Cable Cars" accepted and rebutted the economic challenge of the Mayor and his cronies. In a detailed press release entitled, Statement of Retention of the Powell Street System 1947, they set forth their case. Tourism, in 1946, generated $34,630,522 of new money. San Francisco, "is constantly striving to interest the rest of the world in its historical and colorful background, of which the cable cars are the No.1 attraction. It is the Powell Street line that catches the tourist’s eye." The loss of the famed turntable at Powell and Market would be a loss to San Francisco's identity that "cannot be measured." In the year ending June 30, 1946, Muni buses lost $587,240. By contrast, cable cars lost $75,389, which included a depreciation charge of $19,903. "No one suggests the discontinuance of buses because they are losing money. Any present monetary loss in the operation of the cable cars is more than compensated for by the wide publicity they give San Francisco throughout the world." The total cost of the replacement buses was placed at $366,000. "To this must be added Public Utilities’ own figure of $350,000 to repave the streets on which the buses will run. This brings us to a figure of approximately $716,000 for the installation of the buses, and since buses must be renewed every five to seven years (the Muni’s current practice is to allow a 65 year life expectancy for new cable cars) an additional $366,000 or more must be spent each time." The entire Powell Street line could be permanently rehabilitated for $750,000 (exclusive of new cars) according to the Utilities Commission. Further, the Committee’s press release claimed that cables, parts, and personnel were available and of good quality. The release went on to note that the "superbuses," which are ten feet longer than the Powell Street cable cars and slower loading and unloading, would accentuate traffic problems. The issue of cable car safety was addressed by citing John E. Curley, Director of the Bureau of Accident Prevention, " . . . that the Powell Street Lines had the best safety record of all divisions in times past." In 1945 and 1946, 57 deaths involving Muni streetcars and buses occurred, "none by cable car." In 1946, the Powell Street cable cars took in 91 cents per mile, street cars 45 cents, and buses only 32 cents. "The Public Utilities’ promise...of a profit, if we will just substitute buses, can be gravely questioned." Ridership certainly would decrease. What tourist would come to San Francisco to ride the Powell Street bus? Although the rebuttal case was strong, Friedel Klussmann and associates realized the battle could only be won in the political arena. "Under the present city charter the Public Utilities Department has such broad autocratic powers that only a charter amendment could preserve our valuable world-famous cable cars." Nevertheless, both internal and external forces were beginning to make the Mayor’s lot unpleasant. This was occurring even before Mrs. Klussmann met with the civic minded women to create the "Citizen's Committee to Save the Cable Cars." In the name of "economy" and "progress" Roger Lapham was determined to rid San Francisco of part of its identity. In mid-February Herb Caen wrote, "Roger Lapham’s dictum that ‘cable cars must go’ has been good for one thing, anyway--more publicity than the village has received since the er-uh-thquake; practically every newsmag and newspaper in the county has printed the darn yarn at great length, and the Feb. 24 Life will devote pages of pix to the grippers." Pressure from irate citizens the worldwide was beginning to overtake the Mayor and his crowd. Building on this genuine goodwill for the cable cars, Mrs. Klussmann and her, Committee would succeed in getting a Charter amendment on the November ballot to curb the power of the Utilities Commission and save the Powell Street cables. "... I was waiting for the bus (operating on the former Sacramento-Clay cable car route) at Stockton and Sacramento from 5:30 to 5:45 p.m. along with about 10 others. When the bus finally arrived it was overloaded and did not stop. About two-thirds of the way up the steepest place on Sacramento Street between Powell and Stockton, the bus came to a halt. All of the people had to disembark and start walking in their different directions homeward. The bus seemed unable to go up or down. (Such events were to become legendary until trolley buses took over in 1981). After waiting a while longer most of us walked over to the California cable, and oddly enough we were to get on the first car. Please leave the one decent means of transportation that we have alone. At least give us a chance to vote on the matter." Mrs. Klussmann had her own letter to the editor in which she argued, "The very fact that the Mayor’s own committee on transit was divided on the retention of the cable-car lines in San Francisco shows conclusively that the issue should and must be presented to the voters." A major break for the champions of the cables came when Supervisor Dan Gallagher offered a charter amendment, "which would require the Public Utilities Commission to maintain and operate the city’s existing cable car system." Meanwhile, the Citizens Committee to Save the Cable Cars obtained more than 1,000 signatures in the first four hours of their campaign, April 3, for an initiative charter amendment. On May 1, the City Attorney ruled against Utilities Manager James Turner stating that, "the people can vote on a charter amendment ordering . . . the continued operation of the present cable car system." Friday, April 4, the Chronicle headlined, "Lapham Gets Bitter About Cable Cars." The Mayor had declined to sign the "Committee’s" initiative petition. Lapham rebutted, "I believe I can say, without being accused of undue vanity, that my being retained as mayor (there was a recall petition, which Lapham himself signed!) can hardly be compared to retention of an outmoded and broken down from of transportation." "Who knows . . . they may soon develop an atomic energy propelled bus--and that even before the tears of these petition signers are dry." However, on May 5 the supervisors, by a 7 to 4 vote, placed Supervisor Gallagher’s charter amendment on the November ballot. It was now time to campaign. Soon more politicians and still more of the local press were brought into the fold. The scope of the business community, realizing that the cable car had benefits far beyond its sentimental value, expanded. Cable Cars were an incredible advertising tool to promote and maintain San Francisco's critical industry--tourism. Sentiment combined with economic reality created a force that the mayor could not stop, despite his best efforts. Lapham retaliated by driving a horse car down Market Street as his way of condemning those who distrusted progress. (The mayor’s horse car was actually the Sutter Street Railroad cable car train trailer #54. The train is on display at the Cable Car Museum.) His stunt backfired. Now there were cries of "bring back the horse cars." Visiting celebrities endorsed the cable cars, songs and poems were written, and cable car clothing appeared. 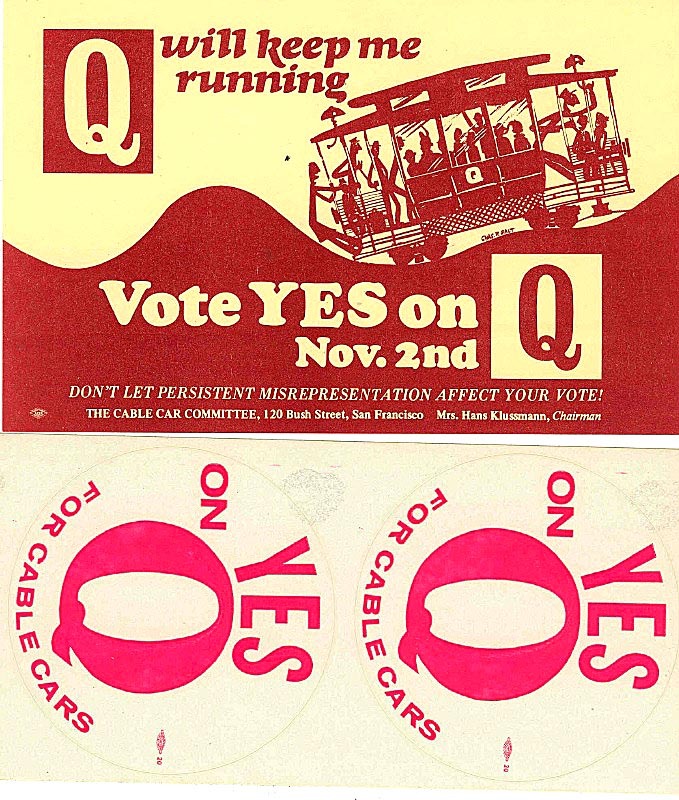 Mrs. Klussmann, two days before the November 4 election, organized a special cable car charter using cars 524 and 527. 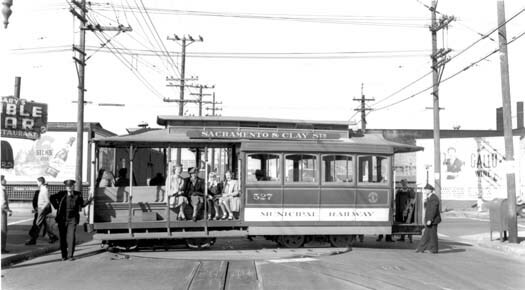 The "Citizens’ Committee to Save the Cable Car" had the 527 signed for the abandoned (in 1942) Sacramento-Clay line. This was to remind voters of what would happen if charter measure 10, the cable car initiative, lost. Measure 10 compelling the City to maintain and operate the existing cable car system passed overwhelmingly--166,989 "yes" to 51,457 "no." It was a victory of sentiment and realistic economics--mobilized by the "Citizens’ Committee to Save the Cable Cars"--over cost sheets and opinions of transportation engineers. Friedel Klussmann’s victory statement said it best, "It is wonderful to know that San Franciscans appreciate their famous, efficient and safe cable cars." Friedel Klussmann’s battle to save the cable cars was not over. The enemies of the cable car were not to be quieted. Railway bureaucrats still eyed as their goal the total abandonment of the cable car system. Nevertheless, for now, victory could be claimed. The information sources used in this paper came largely from contemporary newspaper stories. Published: Vintage Rails, No. 14, September/October 1998. 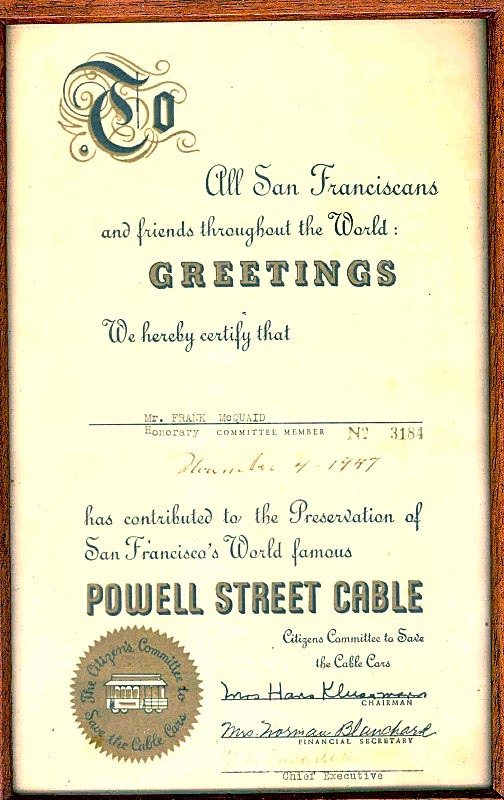 This certificate, signed by Mrs Klussmann, was issued by the Citizen's Committee to Save the Cable Cars to honorary committee member Frank McQuaid for contributing to the cause. Joe Lacey collection. All rights reserved. In the June 2, 1951 Collier's Magazine, Lucius Beebe wrote a feature article entitled "Kowfadakuv!" San Franciscan for "Look out for the curve. This was the warning cable car gripman shouted to passengers to grab the nearest portion of the cable car's anatomy to save from being tossed off by centrifugal force. During the 1982-1984 cable car rebuilding curves were banked to enhance passenger safety, making the cry almost obsolete. 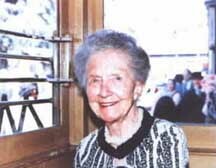 The Beebe piece focuses on Friedel Klussmann and her 1947 successful battle to save the city owned Powell Street cable cars. Support for retention was widespread. As Beebe wrote "Mrs. Eleanor Roosevelt came to town and added her voice to the chorus of protest. Sigmund Romberg and Lawrence Tibbett, on tour, made impassioned pleas from the concert stage and were greeted with deafening applause. Katharine Cornell announced she would never again play in a San Francisco theater if the cars were abandoned. A poll by the San Francisco News showed that sentiment in favor of the cars was better than eight to one. Such curiously unrelated institutions as the Shriners, the Western Pacific Railroad, Billie Burke, the Cab Drivers Union and Salvador Dali rallied to the cause." Ironically, the artist rendering to accompany the Beebe article showing these supporters featured the privately owned California Street Cable Railroad, which was not involved in the 1947 cable car war. 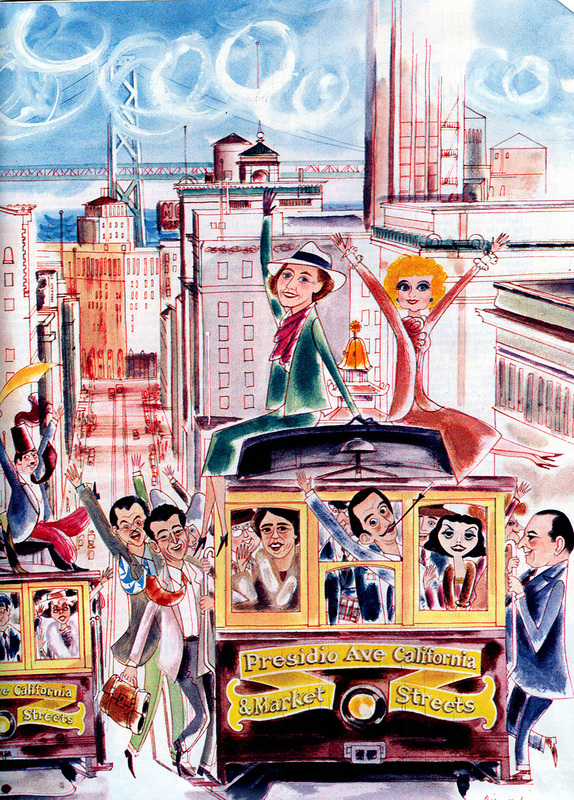 Shown on the inbound California car are Lawrence Tibbett and Herb Caen, hanging on the left side; Friedel Klussmann (in green) and Billie Burke (Glinda, the good witch of OZ) are on the roof; Eleanor Roosevelt, Salvador Dali and Katherine Cornell are at the car's windows from left to right; Sigmund Romberg is the pole hanger on the right. Signs and a letter supporting Proposition Q in 1971. Joe Lacey collection. All rights reserved. 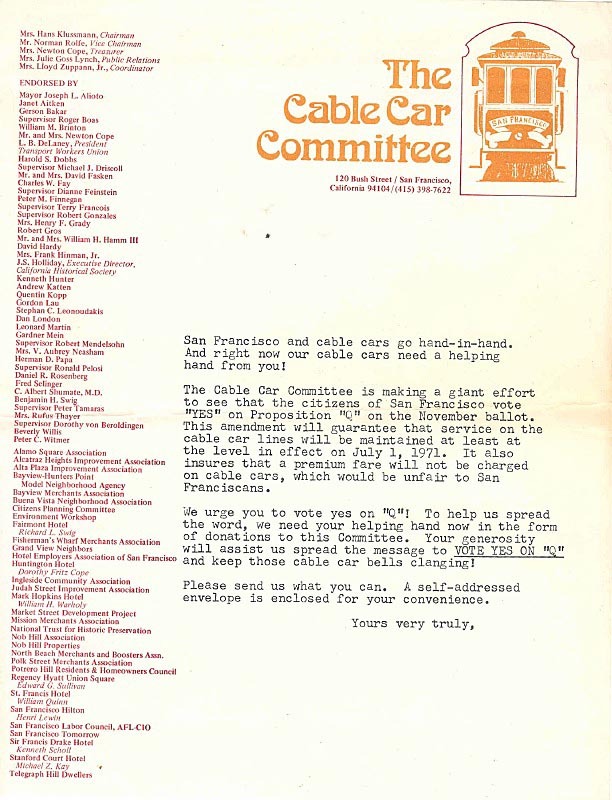 In 1971, in response to threats by Muni management to reduce service, Proposition Q proposed freezing minimum cable car service at the levels of 01-Jul-1971. The proposition was approved by the voters in November. Its provision to keep cable car fares at the same level as general Muni fares was later revoked, leading to the obscene $5 fare. Copyright 2002-2006 by Walter Rice and Val Lupiz. All rights reserved.